On February 6, 2019, about 1530 Pacific standard time, a Piper PA 46-350P airplane, N997MA, collided with terrain while on short final approach to the Aurora State Airport (UAO), Aurora, Oregon. The private pilot and certified flight instructor were seriously injured and the airplane sustained substantial damage throughout. The airplane was registered to and operated by the pilot under the provision of Title 14 Code of Federal Regulations Part 91. Visual meteorological conditions prevailed, and no flight plan was filed for the local instructional flight that departed about 1430. The pilot reported that the purpose of the flight was to practice commercial pilot maneuvers. After practicing slow flight, chandelles, lazy eights, and eights on pylons with no issue, they returned to the airport. The flight instructor and he talked through how to conduct a practice power-off 180° landing as they entered the traffic pattern. When the airplane was abeam the 1,000 foot runway markings, the pilot reduced the power to idle and started a left turn toward the runway. He stated that he realized the airplane was probably not going to make the runway; he last recalls the airplane turning sharply to the left, as he was pulling on the control yoke, and adding right rudder input. 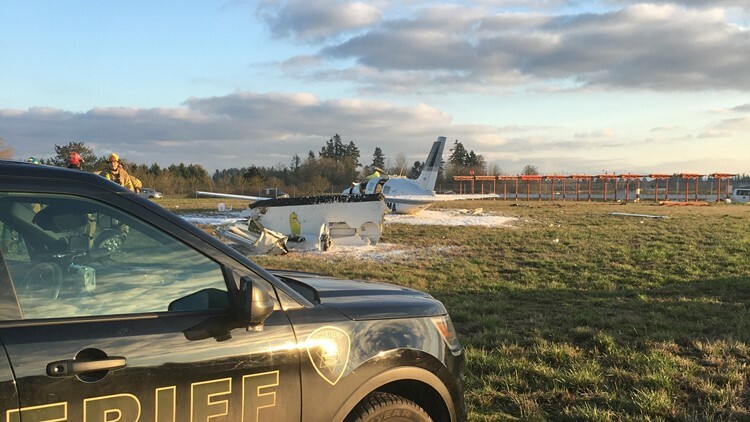 AURORA, Oregon — A pilot and passenger escaped with minor injuries after a small plane crashed at the Aurora Airport on Wednesday afternoon. The crash was reported around 3:35 p.m. at the airport south of Portland. 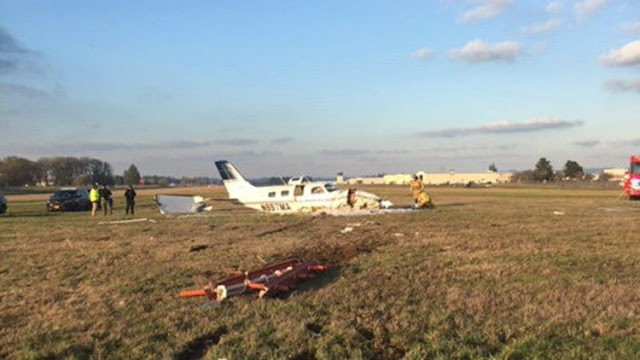 According to the Marion County Sheriff’s Office, the pilot of a Piper Malibu Mirage was attempting to land when the plane struck a radio antenna. Sheriff’s deputies and the Federal Aviation Administration are continuing to investigate the crash. The names of the pilot and passenger have not been released. THIS MAJOR ALTERATION CONSISTS OF A MODIFICATION TO THE AIRCRAFT FUEL SYSTEM TO INCORPORATE A TEMPORARY EXTENDED RANGE FUEL SYSTEM, CONSISTING OF AN ALUMINUM FERRY FUEL TANK, 2 FUEL SELECTOR VALVES AND ASSOCIATED FERRY FUEL FEED LINES, FITTINGS, AND VENT SYSTEM. THE SYSTEM IS CONNECTED TO A TEE FITTING INSTALLED IN THE AIRCRAFT MAIN FUEL LINE, BETWEEN THE AIRCRAFT FUEL SELECTOR AND THE AIRCRAFT FUEL STRAINER. THE FUEL LINE RUNS DOWN THE RIGHT HAND SIDE OF THE LOWER CABIN. THE FERRY FUEL SYSTEM IS VENTED TO CABIN PRESSURIZATION. THE SYSTEM IS REQUIRED FOR A SINGLE CIRCUMNAVIGATION ROUND THE WORLD FLIGHT. THIS MAJOR ALTERATION WILL CONSISTS OF REMOVING THE AIRCRAFT PASSENGER SEATS, FURNISHINGS AND EQUIPMENT, AS REQUIRED, FROM THE PASSENGER COMPARTMENT AND INSTALLING A TEMPORARY FERRY FUEL SYSTEM IN THE CABIN. THE TEMPORARY FERRY FUEL SYSTEM WILL BE CONNECTED TO THE AIRCRAFT MAIN FUEL LINE PRIOR TO THE SUMP. THE FERRY FUEL TANK SYSTEM CONSISTS OF ONE ALUMINUM TANK. THE TOTAL CAPACITY OF THE FUEL TANK IS 140 GALLONS. NUMBER 1: 140 GALLONS RIGHT HAND SIDE STATION 180. THE TANK IS RECTANGULAR IN DESIGN AND CONSTRUCTED FROM 5052 ALUMINUM .100 INCHES THICK BY ROYAL MANUFACTURING OF PLACERVILLE, CA. THE TANK IS PRESSURE AND LEAKED CHECKED AS PER PERTINENT FARS. THE TANK IS ELECTRICALLY GROUNDED TO AIRCRAFT STRUCTURE. THE TANKS ARE VENTED TO POSITIVE CABIN PRESSURE, THROUGH A VENT AND CHECKED VALVE SYSTEM. THE TANK IS MOUNTED ON 1/2 INCH PLYWOOD PALLET AND THE CABIN TANK IS BLOCKED BY THE FORWARD SPAR CARRY THROUGH. THE CABIN TANK IS SECURED WITH (2) 2000 POUND CARGO TIE DOWN STRAPS SECURED TO (4) POINTS OF THE CARGO TIE DOWN RINGS. THIS MODIFICATION IS THE ADDITION OF A SECOND ALUMINUM FERRY FUEL TANK TO THE EXISTING FERRY FUEL SYSTEM AS APPROVED ON FAA FORM 337 DATED 4/28/2015. THE PREVIOUS INSTALLATION INCLUDED VALVES, FUEL LINES, TANK MOUNTING PLATFORM ON THE PILOT SIDE AT STATION 177. INSTALLATION OF SECOND 37 GALLON TURTLE PAC FERRY FUEL BLADDER ON THE LEFT SIDE OF THE CABIN AT STATION 177. THE SECOND FERRY BLADDER IS MOUNTED TO THE EXIST ING 1/2 INCH PLYWOOD PALLET PREVIOUSLY INSTALLED PER 337. THE PALLET IS MOUNTED TO THE LEFT SIDE PASSENGER SEAT MOUNTING PEDESTAL AND FURTHER SUPPORTS THE RIGHT SIDE TANK FOR LATERAL MOVEMENT. THE ADDITION AL TANK IS BLOCKED FORWARD AGAINST THE SPAR AND SECURED USING 2 CARGO STRAPS. THE SECOND FERRY FUEL TANK IS CONNECTED TO THE PREVIOUSLY INSTALLED SECOND TANK SUPPLY VALVE. THE TANK IS A THICK WALL TURTLE PAC TANK, MANUFACTURED IN AUSTRALIA FOR FERRY FUEL SYSTEM INSTALLATIONS. THEY ARE CONSTRUCTED OF POLYURETHANE AND POLYESTER BONDED LAYERS WITH AN INTERNAL DOUBLE LAYER FUEL RESISTANT COATING AND AN ABRASION RESISTANT EXTERIOR COATING. ALL SEAMS ARE ELECTRO-FUSED WELDED WITH SEAM STRENGTH EQUAL OR GREATER THAT THE FABRIC STRENGTH. THE FERRY TANK HAS BEEN PRESSURE TESTED TO 5 PSI. THE TANK MEETS THE REQUIREMENTS OF FAR 23.965 AND FAR 25.965. SEE TURTLE PAC WEBSITE FOR DOCUMENTATION AND SPECIFICATIONS. TEMPORARY WEIGHT AND BALANCE PREVIOUSLY APPROVED FOR THE INITIAL FERRY SYSTEM IS UPDATED TO INCLUDE THE SECOND FERRY TANK AND ADDITIONAL FUEL, ALONG WITH THE FUEL BURN SCHEDULE WITH THE SECOND TANK. THE PILOT SHALL USE THE SERVICING INSTRUCTIONS PREVIOUSLY PREVIOUSLY APPROVED FOR THE SINGLE FERRY FUEL TANK SYSTEM, THEN ADD THE SPECIFIC AMOUNT OF APPROVED FUEL TO THE ADDITIONAL TANK.